June & Jutka – Bizarre Beauties! Thanks to John W for sending this article over in his latest collection of June memorabilia. Hazel has a great smile in this shot in her blue bra and I’d definitely go buy some crisps after seeing this, in fact it’s made me quite hungry, must be time for lunch! As an unrelated aside Meredith & Drew made crisps and biscuits back in the 1960’s and were originally established in 1891. 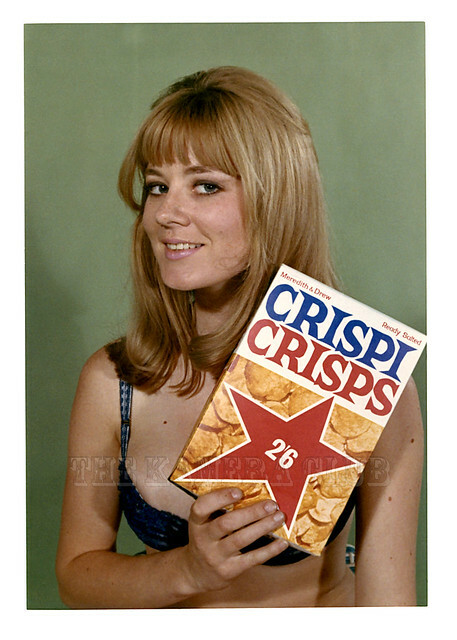 They had around five percent of the British crisps market by 1963 and produced biscuit favourites still around today such as shortcake, currant shortcake, Nice, Bourbon, custard cream and ginger nuts. I used to love ginger nuts! The full history on Meredith & Drew can be found here if your interested?